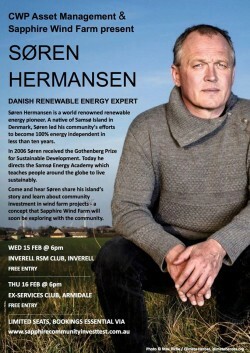 New England Wind is excited to invite you to share an evening with world reknown renewable energy expert, Søren Hermansen from Samso Island, Denmark, with thanks to Sapphire Windfarm. The forums are all the more exciting as CWP ~ the developer of Sapphire Windfarm ~ will be sharing details about how they are gearing up to test the community interest in a community investment component of the windfarm. If the level of interest in the community investment proves to be viable, it is likely to be the first commercial-community windfarm investment of its kind in Australia! APVMA is a ‘go’!! Webinar this Friday: National Disability Scheme – what’s available to you?